The most famous woman of Ancient Athens was Aspasia, the companion of the great leader of Athens, Pericles. Because she was foreign-born (metic) and a courtesan, Pericles was not permitted to marry her, but in every way she was his partner and an important Athenian in her own right. Aspasia was probably a hetaira. There is no English word to accurately translate hetairai, but they were more than courtesans. 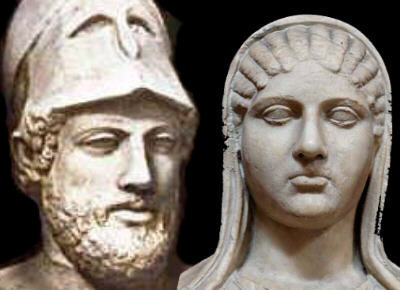 They were indeed sexual partners, but they were also companions, better educated than other Greek women. They were educated in philosophy, history, politics, science, art and literature, so they could converse intelligently with sophisticated men. Aspasia was considered by many to be the most beautiful and intelligent of the city's hetairai. Born in Ionian Greece (today,Turkey), Aspasia ( her name means desired one) was born a citizen of Miletus, but was either orphaned or unwanted. It is possible that her father offered her to the Temple of Aphrodite, an honorable way to get rid of unwanted female children, where they would serve Aphrodite with their bodies. Or she may have come to Athens as an orphan when Alcibiades returned from exile. In any event, she became a courtesan. Aspasia entertained the most powerful men of Athens at her symposia (dinner parties). Though men openly attended such parties, wives did not. The women at these parties were hetairai. Aspasia's house became a fashionable place for the elite of Athens to go. Pericles met Aspasia and immediately moved in with her. He may have divorced his wife to make this possible but in any event, they lived together as man and wife until Pericles died of the plague. The city's laws prevented marriage. He lived with her as her husband and treated her as an equal. This was unseemly for a respectable man, and for a man of Pericles' standing, unheard of. He was often criticized for his relationship with Aspasia, and for his obvious reliance on her help and judgment. Women were not part of Athenian public life, and there was a place for hetairai, but it was in the bedroom and dining room, not in politics. By all accounts Pericles loved Aspasia with a passion that brought him to openly flout such conventions. Plutarch (in The Life of Pericles) and Athenaeus (The Deipnosophistae), who later wrote about Pericles, commented that he was so smitten that he kissed her when he left in the morning and again when he returned at night. Apparently this was a very unusual practice. They had a son together, also called Pericles, who because of their illegal relationship, could not be a citizen (later, after his legitimate sons had died in the plague, Pericles unsuccessfully made an emotional plea to the Assembly to grant citizenship status to his son - it was not until after his death that his wish was granted). The gossip in Athens was always vicious, and Pericles and Aspasia were popular topics. They and their illegitimate son were ridiculed. Many felt that Aspasia had too much influence on Pericles. Some accused her of persuading Pericles to go to war with Samos in order to help her native Miletus. Some even blamed her for the war with Sparta (the Peloponnesian War). "If your neighbor had gold that was purer than yours," Aspasia asked Xenophon's wife, "would you rather have her gold or yours? "Hers," was the reply. "And if she had richer jewels and finer clothes?" "I would rather have hers." "And if she had a better husband than yours?" At the woman's embarrassed silence, Aspasia began to question the husband, asking him the same things, but substituting horses for gold and land for clothes and asking him finally if he would prefer his neighbor's wife if she were better than her own. At his embarrassed silence, reading their thoughts, she said, "Each of you would like the best husband or wife: and since neither of you has achieved perfection, each of you will always regret this ideal." Some believe she may also have been the model for the main character in the comedy Lysistrata. Lysistrata is the outspoken woman who leads the women of Athens to a creative solution to end the war - they simply denied the men their beds until they made peace. Her influence was so great that Plato later joked that she had written Pericles' most famous speech, The Funeral Oration (an official oration for the Athenian soldiers who died at one of the opening battles of the Peloponnesian War). Both Aspasia and Pericles were intellectually curious and on the cutting edge of philosophy, art, architecture and politics. They entertained intellectuals at their home. With her help and support Pericles built magnificent public spaces such as the Parthenon. They lived together for nearly twenty years and ushered in the "Golden Age of Greece," that flowering of culture which continues to inspire us.